So you want to try sushi? Are you new to sushi? Have you ever wanted to try it but were not sure where to start or what you might like? Or tried it and weren’t sure if you liked it? 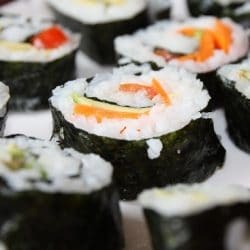 This guide will hopefully offer some information as to a good way to start enjoying sushi if you are a sushi beginner. Many people may say ‘why do I need a guide to try sushi?” This is not intended to be a treatise on the ‘only’ way to start eating sushi, but merely some recommendations for those who are unsure about eating raw fish and may be looking for some direction to ease them into something that they may learn to enjoy. This guide is presented as a list of suggestion to follow or think about when you decide the time is right to try sushi. Try cooked items first. Until you are comfortable with raw seafood, you may want to try the cooked items available before the raw ones. Not all sushi is raw, which may come as a surprise to some, and you can make an entire meal from cooked food. Eel (unagi and anago) is always served cooked, and usually with a sweet and savory sauce. California rolls also have avocado, cucumber and cooked imitation crab meat (called kamaboko or surimi). You can get grilled squid (ika) or octopus (tako). Shrimp (ebi) is a good place to begin as unless you are ordering ‘sweet shrimp’ (ama ebi) it is always cooked. Clam is often cooked as well. Sushi restaurants also often make rolls out of items that are cooked tempura style (battered and fried). Some of these rolls (maki) are actually quite good. Some fish is ‘cooked’ in an acidic marinade, similar to ceviche, which is popular in many countries. With these items, such as mackerel (saba), the acidity of the marinade cooks the fish instead of heat, and adds a great deal of flavor to the fish as well. While a strongly flavored fish may not be to your liking, check the menu or ask to see what may be available. Start with what you know. Sushi is not that different from eating any fish, it’s just not cooked. If you were to put it in the context of ‘seafood’ it should be easier on the neophyte palate. If you like a nice piece of grilled salmon, or particularly smoked or cured, then a piece of salmon sushi shouldn’t that much of a reach. The two main differences are taste and texture, and taste-wise raw salmon is not that different. It may not have the smokiness of smoked salmon or the sweetness of the cured variety, but this particular fish is not that different raw or cooked. Texture wise, it is just a little softer, which will not stand out that much against the rice. Do you like calamari? Try the squid (ika). Do you like scallops? Scallop sushi is almost unchanged from the ‘seared’ scallops served in a nice restaurant, which is only seared on the outside and raw on the inside. Shrimp (ebi) is also widely served. While there are many fish you may not have encountered in a restaurant, there will also be plenty that you have, and will be familiar. Try ‘vegetarian’ sushi. Just to get yourself in the ‘sushi mode’ you might want to try rolls without any meat in them. Kappa Maki (cucumber rolls) are a good place to start. By trying items like these you may become accustomed to the style of food and then decide if you would like to partake of something a bit more adventurous. Start with the cut rolls (maki) instead of sushi or sashimi. One of the many ways of serving sushi, the cut roll or hand roll (temaki) is a good way to start off if the thought of eating raw fish might be off-putting. With the rolls, the items are inside and not staring you in the face, which may be a bit more appealing to some. Sashimi may be the last choice for some as being nothing more than a chunk of raw fish, it may not be the best thing to start with if you are hesitant. With a roll, and sushi, the rice will be a nice buffer, so to speak, for you to become more accustomed to the concept of eating fish raw. Try the items with the least ‘fishy’ intensity. The milder items are a great place to start. Foods such as scallop (hotategai), red snapper (tai), squid (ika), and halibut (ohyo) are particularly mild, and are great for beginners. Tuna (maguro) may look strong due to it’s rich, dark colour, but it is also a very mild fish, and a very common item in sushi restaurants. Putting a hunk of mackerel (saba) in your mouth when you are not expecting something overly fishy can be a deal-breaker for some. The milder fish can still have a great flavor without being ‘fishy.’ The general rule is the less oily, the less fishy, so keep that in mind. Let the itamae (chef) help you. There is a dining choice called ‘omakase‘ which essentially means ‘chef’s choice.’ This means that the itamae will choose what he thinks is particularly good that day and serve you items until you are finished. This is probably not a good choice if you are not sure what you like or definitely want to avoid certain items. Don’t let your friends talk you into this one unless you know what you are getting into, which I explain in my blog entry, omakase sushi. Everyone has different tastes and there is definitely no single way to approach sushi if you are new to it. Always stay at your comfort level and don’t be afraid to not eat something that doesn’t appeal to you. Find your own pace and you never know, sushi may grow on you. As a youth I was told to try something three times before declaring that I didn’t like it. It has worked for me every time and I can’t think of a food that I cannot appreciate. You may not turn into a sushi fiend, but there is a lot to appreciate about sushi and Japanese food in general. Try what you think that you will like and that looks interesting. Have a little sake and relax. Meshi agare!